Brody will soon be available for adoption if no appeal is filed. A Southwest Philadelphia woman has pleaded guilty to animal cruelty charges after being accused of keeping her pit bull, named Brody, in “feces-filled” conditions. According to a statement from the Pennsylvania SPCA issued on Thursday, the woman, Patricia Bryant, 61, of Kingsessing, was sentenced to pay a $50 fine to the commonwealth in addition to more than $700 in restitution to the PSPCA, which has been caring for the dog since it was taken from her home on June 2. Under the sentencing, Bryant is also prohibited from owning an animal for 90 days. 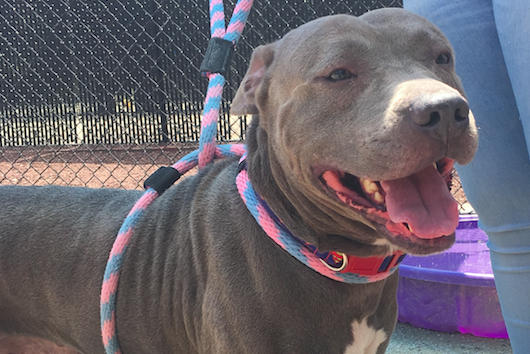 Brody's rescue reportedly came after an anonymous tip to the PSPCA, which said humane law enforcement officers found the dog in “unsanitary,” "feces-filled" and “filthy” conditions. He was brought to the PSPCA, where he remains, and will soon be up for adoption, pending no appeal in the case.